The weather was awesome. Not really the Obamas’ doing, but nice anyway. We waited only 1.5 hours in line as opposed to 2.5 hours last year! Once we passed into the second waiting area, there were free beverages — excellent on a hot day. There were more activities than in 2009, and most seemed way COOLER: real Redskins in the football area, fun “science” activities like dissecting beans, and a bunch of craft tables for making/decorating necklaces, frisbees, and other random kid-junk. We got another commemorative wooden egg. Masher fearfully telling Clifford the Big Red Dog to "Go home!" It was naptime. But that’s our fault. White House security confiscated our empty Sigg water bottles and my entire emergency snack pack, which included — ironically enough — an unopened bag of National Zoo animal crackers. (I was going to entitle this post “The Government Giveth, the Government Taketh Away,” but then Josh reminded me that the Smithsonian is a QUASI-governmental agency, so the title would not have been accurate.) Anyway, I was pretty mad, and more so when I saw several other moms and kids brandishing bananas just steps past security. But I snapped a photo of the offending items, and that was funny because then the security personnel (Secret Service?) started bobbing and ducking, thinking I was going to try to take their photos next. Nothing personal, guys, just not sure you had the guidelines straight! These are our dangerous snacks. I'll admit the dried bananas do look a little weird. 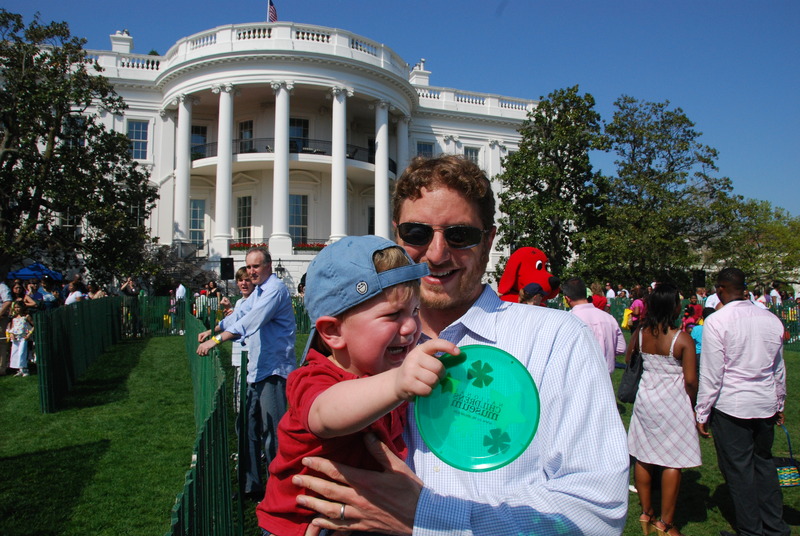 Thanks for having my family and me to the Easter Egg Roll today. We had a nice time once we were in, but I was very disappointed in the security personnel on the way in to the grounds. There was no indication on our tickets that there would be any restrictions on food from outside, so I figured that the rules might be similar to airline rules. I knew I needed to bring food because the food options last year were pretty unhealthy (hot dogs, chips, or cookies), and we also needed water as we waited in the line in the hot sun. 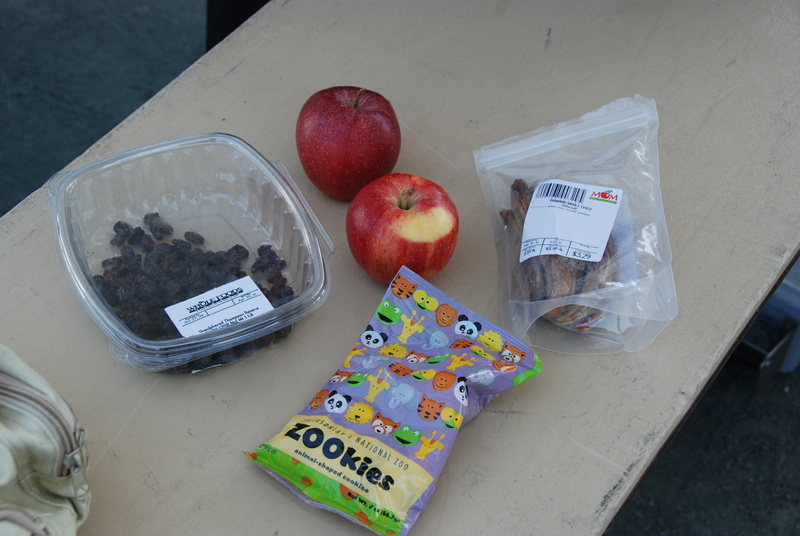 As we approached the security checkpoint, I saw the sign that said “No open food or any beverage,” and I figured we were still fine: we had one box of raisins, one bag of dried bananas, two organic apples, and one unopened package of animal crackers received at the National Zoo a couple of weeks ago. To my surprise, the security person at our gate took everything. Then, as I was pouring the water out of our two Sigg water bottles, just as I would at the airport in order to take the empty container along with me, he told me he needed to take those too, and he did. He did not want to explain his reasoning, and he did not have any interest in asking someone else whether that was the right decision, saying we could get snacks later. Unfortunately, although we very much appreciated the beverages (vitamin-enhanced water and juice) offered at the next stage of the line, we really would have liked just water; the lines were far too long in all of the free food tents on the lawn; and I never saw any other options for buying snacks. I did, however, see and speak with some other women with children who were permitted to bring in several bananas, water, and other snacks, so obviously the person handling my line was abiding by his own rules. And as a result, at the end of the day, I lost approximately $50 due to the confiscation of our food and the two water bottles (which sell for $21 apiece). Comments? Apologies? My money back? Thanks in advance for your response. Wow, I can almost imagine what it’s like to be there! A pox on anyone taking snacks and water from a toddler…don’t they understand it’s not about the nourishment, it’s about the parent’s sanity?